A communal TV system provides television to a number of users from a single aerial or set of satellite dishes. They serve properties like tower blocks or estates of houses and are also used in areas where planning constraints restrict the use and number of roof top aerials and satellite dishes. The benefits of a communal TV system are; added value to the building structure and services reduction or elimination of the need for individual aerials and satellite dishes and associated health and safety issues. Minimise disputes with tenants and also meets planning guidelines. In recent years ABC Aerials have built up a massive list of clients who require our services installing and maintaining large communal aerial systems. Currently much of our work is installing and maintaining existing communal systems for digital reception. If you live in a block of flats and have an aerial system, why not contact us for a free estimate to upgrade it for digital reception. A: With Fibre optics we can install your satellite dish at a much greater distance away from your property than with conventional copper co-ax. Another benefit of using fibre optic cabling in commercial applications is the abillity to add to or extend the system without the need to change the dish setup and no limit on the number of outlets. We offer free planning and design of new communal systems. We can also advise and install the latest technology in order to achieve the very best system for your individual requirements. We install Integrated Reception Systems (I.R.S), the latest development for communal television systems. These systems are set out to provide a multitude of services, comprising of digital terrestrial television and radio reception, together with reception of both high and low band frequencies from the Astra satellites at 28.2 degrees East, with the option for additional facilities such as closed circuit TV. These modern systems can be mains driven or remote powered from each property. 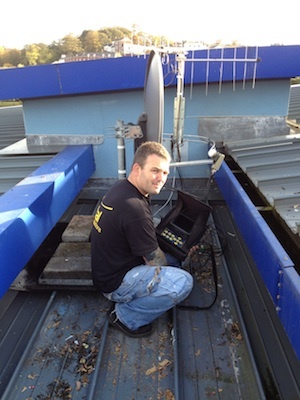 We remove and reinstall commercial dishes & Sky dishes either on a temporary or permanent basis. ABC Aerials Exeter can give you options to upgrade an existing communal system. We are fully trained in all aspects of design and maintenance of communal systems. Communal systems need to be well designed as well as being expertly installed. They also need to meet current earth bonding rules & regulations BS EN 60728. This is all part of our service. We can bring most aerial systems up to date so that they not only conform to regulations but also deliver good reception to every outlet. We are happy to look at your existing system and advise on the upgrade options and give you a free quotation for any work required. ABC Aerials offer a fast repair service and emergency callout service for faulty communal systems. We stock a huge range of communal aerial and satellite system components and are able to get your system up and running fast. We are currently main contractors for Mid Devon District Council and Whitton & Laing property maintenance, servicing and repairing their communal systems. We fault find and repair communal systems for other aerial companies too. We are trained in all aspects of repairs & servicing from the smallest communal system to whole estates and tower blocks. We maintain communal aerial systems, MATV and IRS. We also offer service contracts for our commercial customers. We offer maintenance and calibration of communal aerial systems and general servicing. We are able to offer you our advice and consultation services on the following: New builds, bespoke installations, restoration projects, upgrades and repairs.